THE NATURAL HAVEN: Radical: Not washing your hair at all! Radical: Not washing your hair at all! Chantal sent me an email querying about eliminating shampoo and conditioner completely in favour of occassional use of water and a hair brush to help oil travel down the shaft. This is the 'water only' method. The idea originates from a British woman who says that she has not washed her hair with shampoo or conditioner for 11 years (that was in 2005). She does by all accounts appear to have pretty decent hair (naturally straight hair). 1. Could this work for you? If you can dry brush or dry comb your hair and use no styling aids possibly. The brush appears essential to removal of dirt. However if your hair tends to break or tangle when handled dry don't try it. 2. Is this method more gentle or less damaging? I would guess no and perhaps even guess it may be more damaging for two reasons. First, when hair is shaken in water alone, some protein is lost (i.e damage). Some surfactants in shampoo appear to inflict less damage than water (jog your memory here). 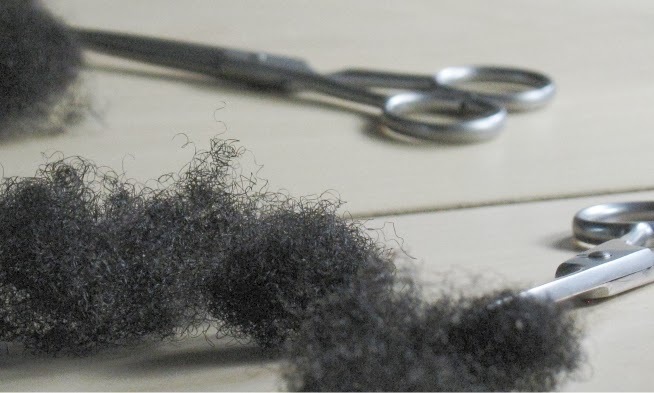 Secondly, using conditioner makes hair easier to comb (the oh so desired slip which lets the comb glide through) so I'm not entirely convinced that leaving it out during the combing process is better (jog your memory here and here). 3. Is this method effective to clean hair? It may be for some depending on where you live/work (environmental pollution = dirt on hair) and how oily your hair is. There are certainly devotees over at long hair community. Unfortunately my search engine is givng me trouble today and won't let me access journals, I will definitely update if I find some interesting science to match. Are you curious, would you try it? Jc: Do the devotees in the long hair community also have haturally straight hair? I would have a hard time seeing how such a method could work for curly haired folk. The thought just crossed my mind too, that - judging from the link you posted - this lady uses no styling products. If she did, she'd need to wash them out with more than warm water... no? That is absolutely disgusting!!! I don't even like the no-poo idea much less, the water only method. She could have all kinds of critters in her head that she might not know about. Shampoo kills those things and not water. Ewwwwww....... Gross!!! Nope. The pollution in both cities were I live might make the squirrels grow third eyes. THAT will not come out with "just a brush." Ruth- one lady I saw has curly hair (like a 3b) but none was type 4. There is like a 100 page thread on the forum and I only flicked through the first five so I cannot say that I have seen everyone on the page. lol True Naturalista, no poo isn't that bad. CHM definitely I think over oily hair is possible but according to the lhc this goes away after a month. I know I couldn't see through the first month lol. lol Alice - I agree with that too. Really interesting post, I only use shampoo once a month and it works best for me dont know if I could go without though. Loving the new layout too. Gerlinde, I shampoo every 3 days or so because I swim. While a bacterial imbalance is possible, I really do not think that washing once a week is excessive. Antibacterial shampoo is not a bad idea I just personally do not think it is necessary to medicate yourself if there is nothing wrong (yes most antibacterials contain a drug of some sort). I think if you are very worried then see a dermatologist who would be able to take a swab and determine if you really do have too much bacteria or an imbalance. Expensive but certainly worth the peace of mind. She mentions that she only washes it with warm water every few months or so. Am I to understand that she puts on a shower cap with her very long hair? Or is she admitting that she bathes every few months or so as well? My folks told me that back in the day that the (Euro) English didn't bathe that often (when there wasn't indoor plumbing). I think that's what this woman is admitting: she doesn't wash anything at all. Having encountered the homeless who aren't fortunate enough to bathe frequently, and people of all stripes who don't wash their hair: she most likely stinks to high heaven. I have to use shampoo at least once a week, or my scalp would be on fire! The itching is just horrible so I wouldn't be able to do that. More power to anyone who can avoid shampoo and conditioner. lol GoldenAh lol!! Let me defend my UK folk - It is not true English people do shower pretty often, most daily. The same is true in most European countries. The only place I have been where showering was not a priority was France. I do think it was just the people I lived with because others did not have the same experience. lol Jae, I think I have made my hair get used to a wash every 3 days or so too. As intriguing as this idea is, I could never do this in India - with the heat, dust & pollution! I think this No-Poo idea would work best if you lived in some small clean country side with clean spring water, fresh air et al.. Thanks Tanveer, yes pollution is a big reason not to do the 'water only' method! this is funny i am happy i read this post. yesterday i read about this grunge movement and people not using products on the hair and it intrigued me. i knew right away my hair wouldn't like it but i was trying to talk my bf into trying it (he is a white European, he doesn't use styling products, he simply shampoo and go... and yes he showers everyday lol) but now that you have posted on it i don't have to persuade him to try it.